Air Power Australia’s predictions about F-35s reduced performance have come true: sustained turn rate specifications have been reduced. This should not have been a surprise. F-35 was never designed as an air superiority aircraft; from its conception on, it was designed as a strike aircraft and tactical bomber. F-35s visual-range performance is rather lacking. Despite goal being of F-35 being equal to F-16C in air-to-air combat, it falls short of that goal. It has a very high wing loading, and very traditional aerodynamics which make it mostly reliant on lift from wings to turn (while it does have some body lift, it isn’t as much as in F-16, Gripen or Rafale). When coupled with its high wing loading, this translates into bad turn performance. Further, stealth requirement of internal missile carriage means that it has far higher baseline drag than modern non-VLO fighters, meaning that it will loose energy fast. Both Typhoon and Rafale can carry 4 missiles in low-drag conformal and/or wingtip stations (Typhoon only has conformal, Rafale has both) making supposed drag benefit of internal missile carriage nonexistent; for larger number of missiles, all three aircraft have to use classical external hardpoints, which add drag. In fact, F-35 drags far more than either Eurocanard, as evidenced by the fact that it cannot supercruise, while both Rafale and Typhoon can supercruise in air-to-air configuration (at Mach 1,4 and 1,3, respectively – it is interesting to note that F-15 has rarely exceeded Mach 1,3 during its 30 year life span). This also makes it clear that both these aircraft can easily out-accelerate the F-35 in air-to-air configuration, including the transonic region. Only when lugging around heavy air-to-ground weapons does F-35s internal carriage provide the advantage, but that question is outside the scope of this article. While F-16 can only carry two missiles in wingtip stations, it does have lower wing loading, higher thrust-to-weight ratio and better aerodynamics than the F-35, including less drag in this configuration at least (and even when carrying more missiles, it will likely drag less than the F-35; see above). F-35A has thrust-to-weight ratio of 1,07 and wing loading of 428 kg/m2 at combat weight. If we compare these values to its predecessor – F-16C – and most similar aircraft regarding roles these aircraft are used in – Rafale C (though where F-35 is 20% AtA and 80% AtG, Rafale is the opposite) – we will see that it is at very large disadvantage. Namely, F-16C has thrust-to-weight ratio of 1,19 and wing loading of 392 kg/m2 at combat weight, while Rafale C has thrust-to-weight ratio of 1,22 and wing loading of 277 kg/m2 at combat weight. As a result, both these aircraft have better instanteneous turn, sustained turn and acceleration than the F-35 – in fact, F-35 is less maneuverable than “Lead Slead” which got wiped out over North Vietnam. And while F-35A has ultimate limit load of 13,5 g, identical to F-16C, Rafale has ultimate limit load of 16,5 which allows it to pull 11 g regularly without reducing airframe life (limit load, at which there is no permanent deformation of airframe). Sustained g is 4,6 g for F-35A, 4,5 g for F-35B, and 5 g for F-35C, compared to 9 g for Rafale and Typhoon. And it is actually a 7,5-g limited F-35C which has best turning performance of three versions due to its larger wings and consequently lower wing loading. Another problem for F-35 is that using full afterburner increases fuel consumption by a factor of five or six. As all aircraft mentioned drag far less than F-35 unless carrying drop tanks or bombs, they could use afterburner more sparingly than the F-35, eventually running it out of fuel and forcing it to break, then shooting it down. Its ability to achieve 55 degree angle of attack has been quoted widely, but without some important buts. First, such high angles of attack must be utilized carefully, since they bleed off energy very quickly, and aircraft must be capable of recovering lost energy in short order. F-35, with its high drag and low thrust-to-weight ratio is incapable of doing so, making any excursion into high angles of attack a death wish – if F-35 doesn’t kill the enemy, it is likely to end up dead (and as air-to-air engagements are between pairs, flights and squadrons, and more rarely wings, and never between individual aircraft, it is likely to end up dead even if it does kill the opponent). Second, many other aircraft have proven capability to fly at higher angles of attack – namely, Su-35 (120 degrees), Rafale (>100 degrees), Gripen (>100 degrees); this does require FCS override – normal FCS limit for all these fighters except F-18 is ~30 degrees – but is possible. Rafale’s close-coupled canards allow it to achieve higher Cl for same angle of attack, resulting in less drag. F-35s HMD system, supposed to allow pilot to look through the floor, has major issues. Cameras used are very low-resolution, and HMD itself has problems with lag. In visual range, F-35s stealth is worthless for several reasons: first, it has large frontal visual signature; second, it has large IR signature and third, at such ranges enemy radar will be capable of picking it up from any angle. HMD, coupled with HOBS, is intended to allow F-35 to shoot down opponent with missile doing most of the maneuvering. But last time that so much faith has been placed into the missile at expense of the airframe performance was the Vietnam war – assumption was that F-4 will shoot down the enemy far before having to commit to merge (it wasn’t even equipped with the gun), but it failed repeatedly. As a result, F-4 was equipped with gun pods, but its size and weight still left it at disadvantage against North Vietnamese fighters, some of which were Korean war-era designs. If it is not fixed, almost-nonexitstent rearward visibility and extremely thick canopy bow frame will present major issues (as many pilots believe, “If you can’t see out of it, it is not a fighter” – and F-35 confirms that belief). In fact, as R. Whitford stated in “Design for Air Combat”: “The wheel may be on the turn again, however, since the concern with low radar reflectivity is focussed (sic!) on those parts of the aircraft which, like the cockpit, make large contributions to radar signature. As a result, submerged cockpits for strike aircraft may reappear.” If all missiles are spent, or enemy comes witin minimum range of missiles F-35s carries (not very likely since F-35 will probably end up dead far before that), F-35 will be forced to use its gun. But gun in question, GAU-22, is a Gattling design; in F-35A, it is carried internally and covered by gun doors which take 0,5 seconds to open. This means that gun takes a full second to achieve full rate of fire. As a result, in first second after pressing the trigger, GAU-22 will fire 27 rounds weighting 4,97 kg, compared to French GIAT-30 which will fire 40 rounds weighting 9,76 kg. Gun is inaccurate, and pod version has problems with vibrations (F-35 can fire it for 3,8 seconds, and Rafale for 3 seconds; at 0,5-second bursts, it means that both carry enough ammunition for 1-2 kills). Further, an all-HMD cockpit is inherently inadequate for efficient utilization of gun due to lack of accuracy. Due to that, F-35 has to rely on hit-and-run attacks from beyond-visual range. But BVR combat has so far only been useful againstunderequipped and rather incompetent opponents. Not only BVR missiles themselves are unreliable and easily evaded, they are also prone to being jammed or decoyed by a towed decoy. And even if BVR missiles become useful, it won’t render F-35 immune: it is far from invisible or even LO, liable to being picked up by QWIP IRST from very long range (likely 100+ km from front in ideal weather, far beyond the longest-ranged BVR kill ever) and attacked by IR-guided BVR missiles such as French MICA IR. This is a result of its very fat, aerodynamically compromised body and very powerful engine in the back, required to push its heavy mass and brutal shape around, as well as lack of IR signature reduction measures. In fact, F-135 is world’s hottest running fighter engine. And if attacks miss – a very likely possibility, considering F-35s loadout of only 4 BVRAAM when in “LO” configuration – F-35s maximum dash speed of Mach 1,6 means that it will be unable to run when faced by fighters which have higher maximum speed in air-to-air configuration. Namely, both Rafale and Typhoon have maximum dash speed of Mach 1,8 in air-to-air configuration, Mach 1,6 for longer periods of time and Mach 1,4 / 1,3 when supercruising (F-35 is only capable of subsonic cruise), while Su-35 has maximum speed of Mach 2,35 when clean, translating into Mach 1,8 – Mach 2 in air-to-air configuration (depending on number of missiles carried). And if F-35 wants to carry more missiles, it rapidly becomes non-LO. Its sensors suite and countermeasures are not unique. Like F-35 itself, Dassault Rafale is capable of targeting enemy fighters just by using their radar emissions. While F-35 has frontal-only EOTS IRST and additional 360-degree FoV DAS (a system of low-resolution IR cameras) which also acts as a missile warning system, Rafale has frontal-only OSF (IRST and video camera) plus DDM NG consisting of two fish-eye IR cameras which also act as missile warners and provide 360*360 degree coverage; both OSF and DDM NG are entire generation newer than F-35s IR sensors. EOTS is, unlike other IRSTs on market (PIRATE, OSF, OLS), intended for air-to-ground missions. For this reason, it is positioned low on the nose and can only detect targets below and directly in front of F-35, but not those that are above F-35; frequency coverage is also optimized for air-to-ground missions, reducing its performance when used for detecing other aircraft. It only has one IR band, compared to two for Rafale and Typhoon. It also has a laser rangefinder which will, unless shut down, give away F-35s position. DAS is claimed by some to have 800-mile range, but this was achieved by a very-not-difficult target to detect; namely, an ICBM. To realize how important size of target and temperature difference between target and the background are in IR detection, one should only remember that Typhoon’s PIRATE has detected Venus: an equally inconsequential event, but demonstrates the point nicely. As seen above, using IRST to detect an IRST-equipped opponent will result in the F-35 being detected first. Thus, the F-35 will have to use its radar to detect the opponent, but this does not make situation better – in fact, it makes it worse. While radar itself is LPI AESA, there are some serious problems with oft-heard claim that it is undetectable: frequency hopping is of limited usefulness as all US radars operate in frequency range of 8 – 12 GHz, and wide-frequency RWRs exist (Rafale has one capable of detecting radar frequencies that range from 2 to 40 GHz); second part of LPI procedure used is to reduce power of the signal, but considering that very small percentage of radar signal returns to the radar (less than 1%, since most of transmitted signal doesn’t hit target, and even with barn-door RCS F-15, 75%-90% of the signal that does hit the target is reflected away from the radar – a family car has RCS of 100 m2, compared to 25 m2 for F-15), this can never be sufficient to blend signal into the noise. Assuming that F-35 somehow (through magic or divine intervention) manages to attack enemy fighter with a BVR missile without being detected, enemy fighter’s missile warners will detect its missile and it will be possible to roughly find F-35s location by extrapolating from missile’s direction. And while F-35 is stealthy to X-band radar from front and sides, top of its fuselage is rounded and bottom is very bumpy. What this means is that it will get detected by the enemy radar as soon as it maneuvers. As a result of this problem and ones discussed in previous four paragraphs, F-35 is actually not a stealthy aircraft (in fact, “stealth” as such does not exist, what does exist is radar low observability of various degrees). Finally, BVR combat presents a major IFF problem. Electronic IFF is not very useful since pilots only turn it on when outside the combat zone, since active emissions give away their positions. Even optical sensors, such as Imaging Infrared or visual camera, can misidentify aircraft, though chance is less than with IFF transmitters. This is rather informative graphic about F-35s performance, which doubles as a warning against relying on pilots’ claims: http://media.defenceindustrydaily.com/images/DATA_F-35_Air_Air_Argument_2013.gif F-35s problems are mainly result of two decisions: first, to have perfectly unnecessary STOVL capability; and second, to focus on strike missions. While it is possible to make a good multirole aircraft from design optimized for air superiority (see: F-16, Rafale, Gripen), it is impossible to make a good multirole aircraft from a design optimized for bombing (see: F-105, F-111). And while some may bring up F-16s 67-1 kill ratio as justification for F-35, F-16 has far better aerodynamics, and most of kills were achieved within visual range, by skilled Israeli pilots (and against less than competent opponents). In the end, F-35 will be victim of its own reliance on high technology and excellent demonstration of Murphy’s Laws. But aircraft’s air-to-air capability should not be only considered on a per-platform basis. War is waged by systems, and numbers deployed matter, as does the coordination and maintenance. F-35 has good C4ISR capabilities, but it is nothing that cannot be put into other aircraft (and Rafale may have similar capabilities). But where F-35 is hurt are numbers: at over 180 million USD unit flyaway, a squadron of F-35As costs 2,16 billion USD while flying no more than 9 sorties per day. For same cost, one can buy two squadrons (24 aircraft) of Rafale Cs, which will then fly 57 sorties per day, or three squadrons (36 aircraft) of Gripen E, which will then fly 78 sorties per day. As war progresses, F-35s will face increasing problems with maintenance, forcing a reduction in sortie rates that will be far more than other aircraft will suffer. So why is anyone buying it? It is simple: UK and Italy are procuring the F-35 only because it is the sole currently avaliable vertical-takeoff and landing fighter, a feature that they require for their shortsightedly-designed carriers, while Israel and Japan need the US goodwill in face of agressive neighbours and procuring F-35 is paying the price for that goodwill (a.k.a. “sucking up to boss”). Another reason is that the F-35 is (incorrectly) promoted as F-16s successor, and all listed countries are or were using the F-16 (except for UK, which is replacing Harriers with the F-35); and in Norway and Netherlands at least there is also a good measure of arm-twisting thrown in. And all claims about F-35 being a revolution in warfare sound, for above reasons, as a repeat of 1957 UK discussion, when British establishment declared manned fighters obsolete. Combat still takes place at speeds 50% to double of those in World War II. For conclusion, note when reading comments about F-35 by officials: in marketing, “comparable” is the word used when one can’t claim “equal” or “better”. To give an example, in marketing speech F-35s 526 kg/m2 wing loading is “comparable” to Rafale’s 328 kg/m2, with difference of “only” 200 kg/m2 in Rafale’s favor. This entry was posted on September 1, 2013 at 12:19 pm	and is filed under Uncategorized. You can follow any responses to this entry through the RSS 2.0 feed. You can leave a response, or trackback from your own site. I believe that the F35 is only a project to keep LMC busy and profitable while the 6th gen aircraft is in development. Just a profitable exercise for all involved except the taxpayers. Indeed. And most US warplanes, P-51, F-16, A-10 and possibly F-86, excepted, were like that in nature. They could have just kept on building F-22s then! At least F-22s would put up a fight against modern warplanes! It would. But the F-22 is a single-role fighter, less complex than the F-35, was built in fewer states, could not be exported and had no foregin partners, so it was easier for politicians to decide to cancel it and harder for MICC to defend it. Especially since F-35 is actually three very different aircraft that share the same name and some common components. 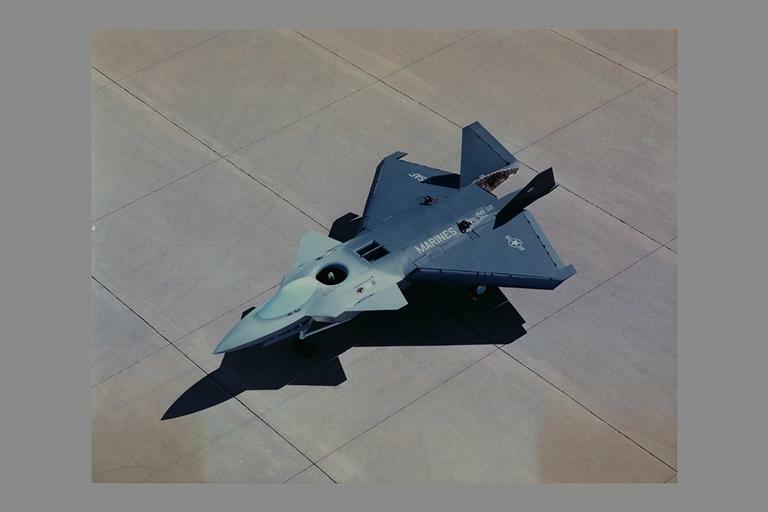 http://www.globalsecurity.org/military/systems/aircraft/images/x-32-AC95-0019-8_a.jpg Have you seen its first prototype airframe? I did. Better than what followed it.